The red boxes on the left of this stamping machine don’t look like much, but they are part of the sensor interface that monitors production of metal fasteners that Versatility Tool Works & Manufacturing turns out at a rate of 1 million per shift. By monitoring key parameters of the stamping process, VTW eliminated errors. When one of the monitored parameters is found to be out of operating range, the machine shuts down until a worker solves the problem. 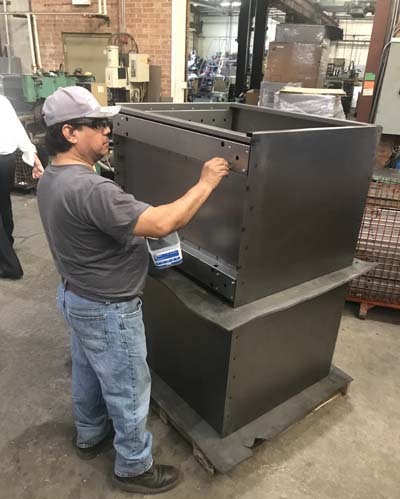 An Alsip, Illinois manufacturer of sheet metal enclosures and high-quantity stampings embraces technology to speed products to market. When faced with a design and manufacturing challenge, Versatility Tool Works and Manufacturing Company, Inc. (VTW) looks to its 46 years of tool making and manufacturing experience for a path that saves money and builds a better product. It considers a new and evolving process, such as robotic welding, laser printing and electro-mechanical assembly. 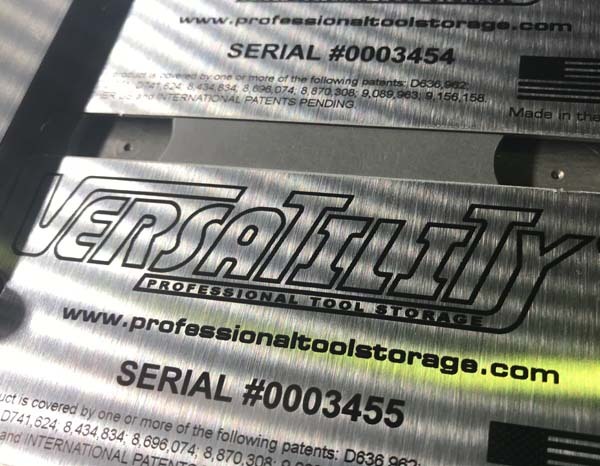 Versatility Tool Works makes tools, as needed, as well as investing in new technology that might save customers money while they tinker, tweak, and redesign their new part. To keep up with changing demands, VTW invested in turret punches, press brakes, and lasers. Hard tools or progressive stamping tools are designed after the part is properly designed and the customer wants to make a million pieces. To keep up with quickly changing demands as a customer designs and then tweaks the part, VTW invests in manufacturing processes that can change fast. Once the robots have finished welding the heavy-duty tool box, human workers step in to remove the box from its fixtures and sand down weld marks. Here, a worker prepares a cabinet shell for painting. In addition to new turret punches, press brakes, and lasers, VTW embraced robotic welding. Versatility welds a line of high strength, high precision tool boxes robotically in a space that is roughly 20 feet by 30 feet. Two employees handle the work. Steve Freimuth explained the advantages of robotic welding by saying if the same tool box was welded by an assembly line of machines, it would be 10 or 20 feet wide by 70 feet long. It would require seven or eight machines and two people per machine. In this case, the robots are better welders than people. To make the robotic welding line work, VTW developed expertise in several areas, including fixturing and production. 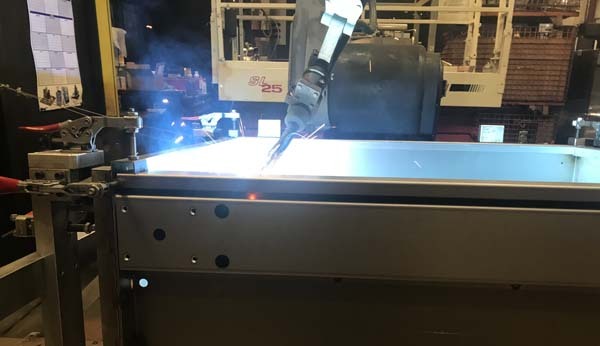 A robotic welder is welding this tool box together while the parts sit in a fixture designed to hold each part in exactly the right spot. In addition, each part may have self-fixturing components that help each part stay in the right spot in the fixture for precise welding. One customer asked VTW to solve a problem it had with another supplier who kept delivering fasteners that did not meet quality standards. What should have been a simple, common part, wasn’t simple because the other supplier couldn’t hold tolerances. Today, VTW makes one million of the familiar home and office fasteners per shift. These are fasteners that have two folding flaps that people insert through paper holes and then bend flat to hold the paper in a report binder. Think school report folder. To date, VTW has manufactured 4 billion fasteners on a Bruderer press that VTW fitted with six sensors to measure tolerances inside the tool to make sure every part is correct. Versatility had two options for checking quality, and it settled on the sensors. The other option was to hire people to sit around and measure 100,000 fasteners after they were produced. This stainless steel label is laser marked at VTW and then attached to its industrial tool boxes. By doing these serial number plates in house, VTW estimates the internal process saves production time and costs. “The quantity of the parts is just too great to measure piece by piece,” Ed Freimuth said. Instead, the sensors will shut off the machine if a part is produced out of tolerance. To figure out the critical parameters, VTW investigated the process and found six measurements inside the tool that were critical to success. 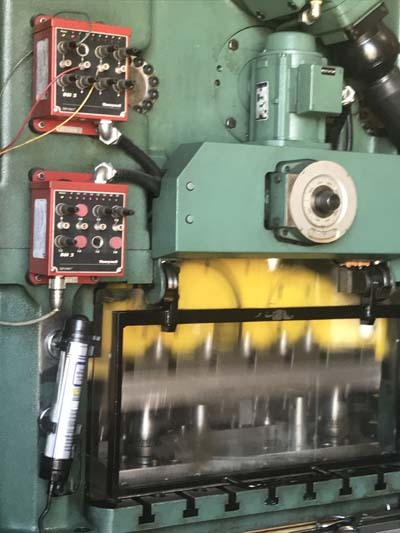 Sensors test the metal hardness, its thickness, the feed length, the siting of the stripper plates, the speed, and the height of teeth on the hexagonal ring. Every single time the machine stamps, which is 14 parts per second, the sensors measure those six variables. “If you monitor the process, and the process parameters are on target, you always create good parts,” Ed Freimuth said. When customers challenge VTW with a new problem, VTW invests in new equipment to meet the customer’s need. 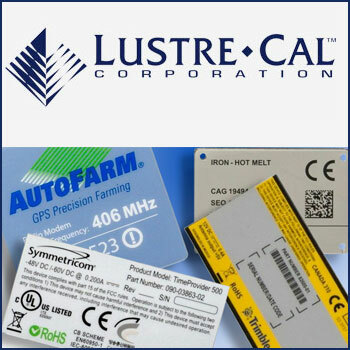 Versatility purchased laser marking equipment to print serial numbers, logos, and other markings for clients because it saves at least a week that was otherwise wasted by sending a piece out for marking. 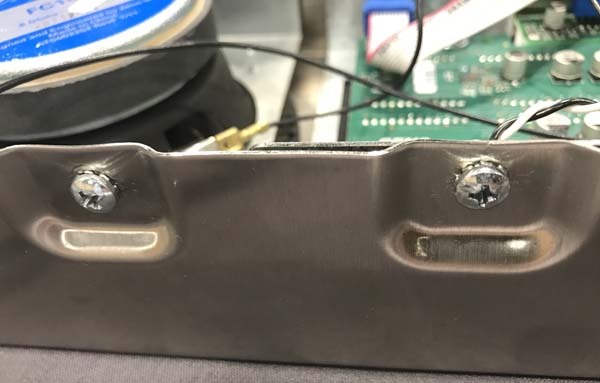 For another OEM, Versatility was asked to solve an electro-mechanical assembly problem with an enclosure that arrived at its customer’s facility with broken welds inside. A sheet metal enclosure could be a box, such as a file cabinet, a tool cabinet, or any a metal telecommunications or computer box that protects internal components or assemblies. Versatility Tool Works solved broken welds for a customer who turned this audio component over to them for improvements. Versatility redesigned the enclosure by adding embosses for clearance, and an internal circuit board chassis. Mechanical fasteners were used instead of welds to hold everything together. It was then able to lower the weight by 50 percent by thinning the steel, and in the process creating a defect-free design. This enclosure held a combination of speakers, printed circuit boards, and a viewing screen. It is a common communications device that is placed in various rooms around a school so administrators can speak to each classroom and vice versa. Hospital administrators use it to talk to various offices or people around the building. They can project news or information on the screens when desired. “The customer came to us and said ‘We’re having quality issues with our current supplier of this particular assembly,’” said Ed Freimuth. Versatility Tool Works analyzed the other’s supplier’s work and figured out how to build it without the welds that kept failing. A secondary problem was aesthetic. The enclosure arrived with welding marks visible on the outside. Versatility swapped 16-gauge steel for 20 gauge steel. What had been 0.060-inch became roughly 0.030-inch. That’s cut steel consumption in half. “The other issue is the studs would fail in shipping. The studs would break off—it was complete product failure,” Ed Freimuth said. Parts bounced around inside upon delivery. Versatility changed its enclosure design with help from its sheet metal expertise. Employees rejected the idea of welding attachments between the enclosure and its internal assemblies. Instead, they designed an interior chassis that they attached to the outer enclosure with bolts. Each component was bolted to a chassis. The threads that connected the chassis to the enclosure were tapped in depth as it was blanked from stainless steel sheets.